Last night was a bit exciting for both of us. 1) We got to explore a few areas in the Pfizer Building--its the former home of Pfizer that's been slightly abandoned. A developer is turning it around and bringing in food companies needing commercial space. There are some totally creepy spots and totally awesome ones too! I spotted at least one "Mustache Covering" sign! 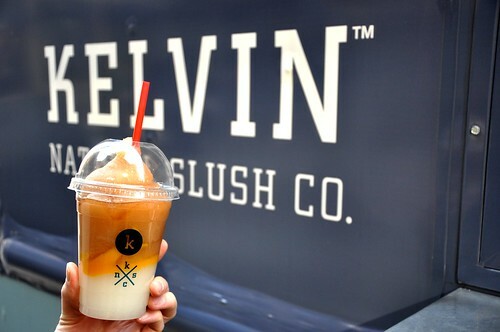 2) We were there to test the boozy slushies we'll be making with Kelvin Slush at the Vendy Awards!! In prep for our demo and their boozy slushies, we penned a post for the Vendy blog that went live yesterday. Right now we *know* we're going to have a white peach Bellini. It was just too good, we can't not share this with the world. As for the other drink, you'll just have to wait and see! I can guarantee it's going to be absolutely wonderful to drink at 11:30 in the morning when you have a full day of food ahead of you. VIP tickets are still(!) available! You get to hang out with us, and Kate Krader from Food & Wine, and Zach Brooks from Midtown Lunch, *AND* Ed Levine from Serious Eats! And you can go on a mini tour care of Turnstile Tours. *AND* you get to eat to your heart's content BEFORE the crazy lines!